I am trying to install the hook2 7 tripleshot in my new 2019 outback. The instructions in the owners manual are not clear enough for me. Has anyone done this and maybe could help me with what I am missing? I have the guardian shield off, I installed the scoop nose. The transducer fits through that and then the mounting holes stick up into the inside. 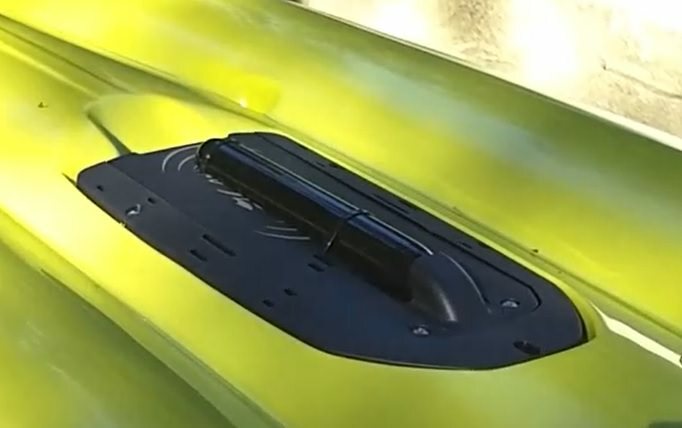 The hobie manual says that the transducer will go on the outside, but that for the rest of the install, follow the directions for the skimmer style. I dont understand the skimmer style. It says that it should mount to posts inside the cavity. It then shows an illustration that does not make sense to me. has anyone installed this transducer? I could really use some help or a picture of the inside of a completed guardian shield/mount. This might lead you down the right path. Thanks man. I saw that one. Unfortunately the totalscan transducer mounts differently than the hook2 7 tripleshot. At least from what I can see. I agree, the instructions are not good. In the end, it isn't too difficult and the Hobie pass through gaskets are great, there is a double one that fits both the Lowrance cables perfectly. I ended up using 2 nylon ties to keep my transducer very secure, they can be seen in this image if you look carefully. Did you end up using those two "clips" that hook unto the upright posts on the underside of the guardian? how is the transducer secured inside, or is it just the zip ties holding it on? it is secured on the inside basically as the instructions suggest, as best I could follow them. but that left too much play and wiggle in the transducer, so I added the first zip tie in existing slots and drilled holes to add the second zip tie down at the loose end of the transducer. Thank you. Did you use the friction gaskets that came with the lowrance? Or did you just use the clips directly attached to the transducer? 3: Secure the rear of the transducer with the zip tie included with your TripleShot for a flush fit to the bottom of Guardian. 5. Run the transducer cable through the scupper above Guardian and back into the hull through the 3-way plug, secure the scupper cover plate, reinstall Guardian to the brass inserts in the bottom of the hull and carry out the remainder of the fishfinder installation. Detailed installation video will be posted soon to our YouTube channel. The friction washers, Are those the foam ones that came with the kayak? They look to have ridges in the photo, and I do not have any that look like that. I assume the foam ones would work, would they not? The ones included with your Hobie are a nylon reinforced rubber washer, and yes they should provide enough friction to prevent again rotation. What the drawing shows are two pieces that come with your Lowrance. When mounting a TripleShot, I'd recommend using the rubber washers included with your Hobie owner's packet, and zip tying around the transducer for extra rigidity and security. Thank you for the pictures and video. This was a pretty easy install once I saw them.